REVIEW 5 QUESTIONS Q1. List the terminal devices used with IVCS. a. b. Q2. What is the purpose of the ICSC within the IVCS? COMMUNICATIONS SECURITY Learning Objective: When you finish this chapter, you will be able to Identify basic communications security procedures. Communications security is defined as the protective measures taken to deny unauthorized persons information derived from telecommunications of the United States government that are related to national security and to ensure the authenticity of each telecommunication. Classified information may not be discussed in telephone conversations except as may be authorized over approved secure communications circuits. When in doubt about the classification of information necessary to answer a question asked in a telephone conversation, you should say nothing. When answering a telephone on a nonsecure communications circuit, you should inform the caller that the telephone is nonsecure. For example: Quarterdeck, USS Never Sail messenger of the watch speaking, sir this is a nonsecure telephone. ANNOUNCING AND INTERCOMMUNICATION SYSTEMS Learning Objective: When you finish this chapter, you will be able to Recognize the purpose and use of the announcing and intercommunication systems. 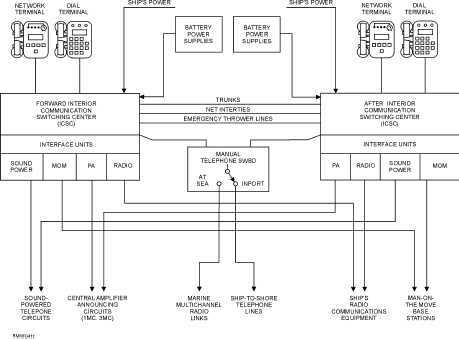 The general purpose of shipboard announcing and intercom systems, circuits 1MC through 59MC, is to transmit orders and information between stations within the ship by amplified voice communication by either a central amplifier system or an intercommunication system. A central amplifier system is used to broadcast 4-13 Student Notes: Figure 4-11.IVCS block diagram.